After a nationwide search, parents of Madelyn travel to NYC from Georgia for surgical treatment of a very painful pediatric bunion. 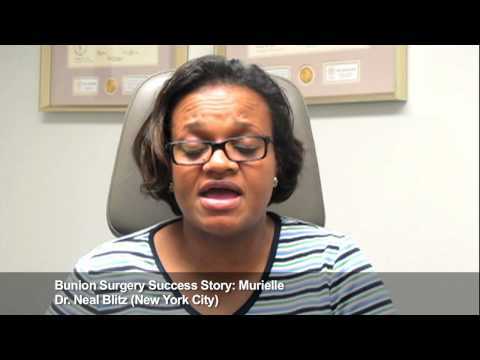 I’m from South Georgia and we traveled to New York to have surgery with Dr. Blitz for my daughter Madelyn who’s ten with bunions. Dr. Blitz has been so good. He’s not only a knowledgeable physician, he’s also a good person. And I cannot say enough about, you know, it’s worth the travel to get there for the peace of mind that your child is being operated on by somebody that really cares. Traveling to New York for foot surgery was actually very simple. We visited Dr. Blitz in his office before the surgery. We had surgery at Mount Sinai, everyone there was wonderful, we had wonderful patient care. We stayed in a hotel nearby and we actually had Dr. Blitz visit us in our hotel room the day after surgery. And then before we flew back out, we visited him again and I just can’t say enough about the continual patient care. Madelyn has so enjoyed working with Dr. Blitz. He’s very kind, he’s very caring, he’s funny, he just has a wonderful bedside manner. I will definitely be back. Madelyn needs her inner foot operated on in the future. I will be back and I would recommend Dr. Blitz to anyone.